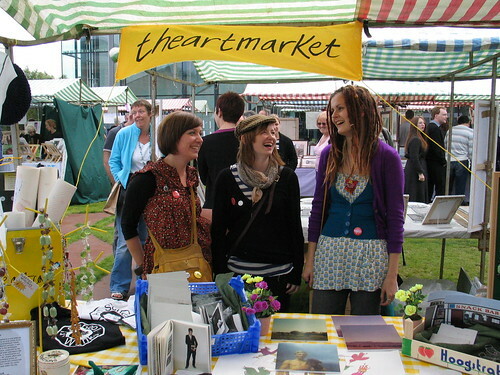 Theartmarket had a stall at ‘The Really Super Market’ at centre square and MIMA garden, Middlesbrough on Saturday 22nd September 2007. 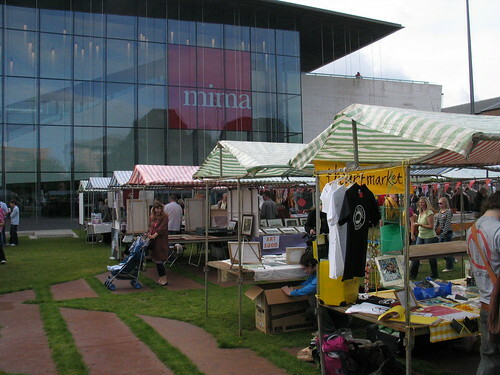 The event was organised by Bob & Roberta Smith (‘Make You Own Damn Art World’) in association with MIMA and the Dott07 festival. The theme for the event was art and food so there was an array of great-tasting art and good-looking food (to quote S. Barrett). Visitors could vote which was best: art or food? As well as taking some of our original hand-made shop stock, we took along some fresh work made especially for the event by core artists Lil Adams and Sarah Barrett. Lil made jewellery with sweets, pasta tubes, cheese and shrunken crisp packets. Sarah created some cards, prints and a watercolour series of Bettabuy products.